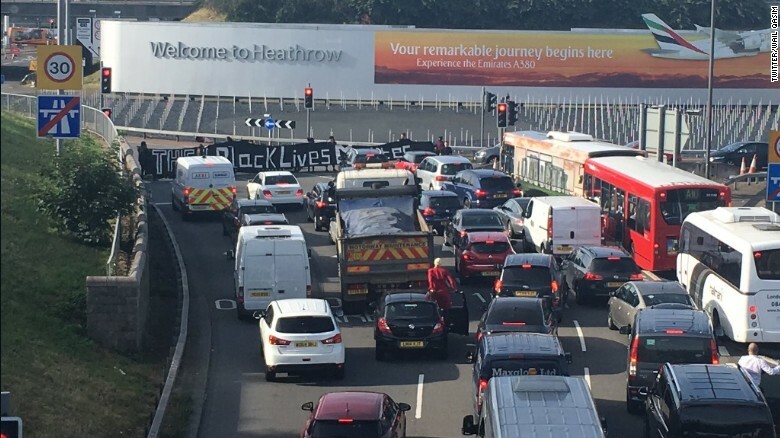 Black Lives Matter UK campaigners have blocked roads leading to London's largest airport, as part of a series of nationwide shutdown protests on Friday. Transport routes in other British cities have come to a standstill, with demonstrators chaining themselves together in Birmingham and Nottingham. More protests are planned in Manchester later today. The UK-wide protests mark five years since 29-year-old black man Mark Duggan was shot and killed by police in north London, his death sparked riots across the capital and other British cities. "In the UK, families have in some cases been waiting decades to find out what's happened to their loved ones who have died in custody, or to get a straight answer -- even where wrongdoing has been found to be by police officers," Black Lives Matter UK spokesman Wail Qasim, 23, told CNN. "So this demonstration comes after a decade-long struggle and it's to highlight what's happening." From around 8.20 a.m. local time (3.20 a.m. ET) several demonstrators began chaining themselves together and lying across the M4 motorway leading to Heathrow Airport beneath a banner reading: "This is a crisis." Ten people have been arrested, said London's Metropolitan Police. The airport is Britain's largest, handling over 205,000 passengers daily and host to 80 airlines traveling to 84 countries across the world.